Dads – our everyday superheroes. Whether they’re teaching us how to ride a bike, picking us up when we fall down, embarrassingly cheering us on at sports games, sitting next to us on our first rollercoaster ride, rushing to our rescue in a time of need, cracking a terribly cheesy joke, or enlightening us with their infinite wisdom, our fathers and father-figures enrich our lives with so much each and every single day. Father’s Day is the one day a year dedicated to celebrating our dads and everything they have done and continue to do for us. There are so many different things to do in Dallas this year, but what better way to show dad your appreciation than treating him to a delicious meal in the West End Historic District? Here are 3 restaurants with Father’s Day specials that your dad, grandfathers, uncles and father-figures will love. Each year, Chef Tony Street and the folks at Y.O. 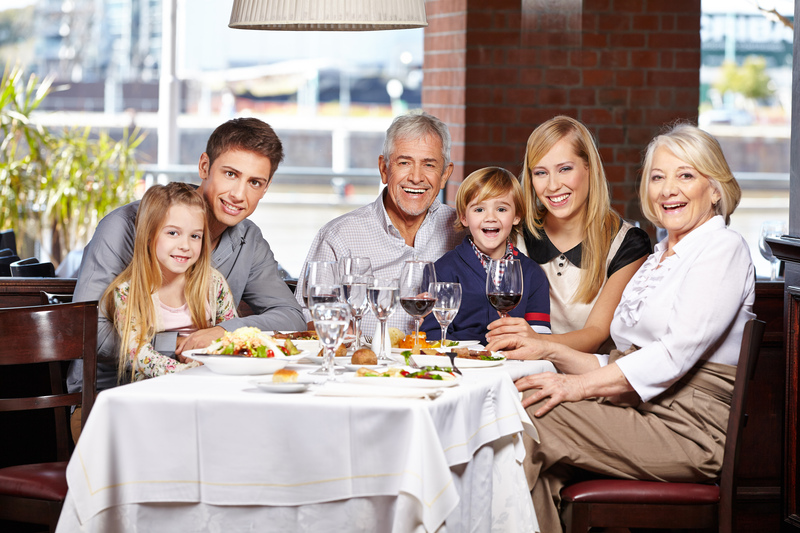 Steakhouse put together a special menu just for Father’s Day. 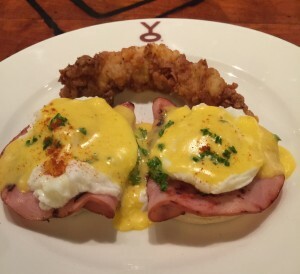 This year’s 3-course brunch is full of Hill Country classics with a French twist. Dad will have many options to choose from, including Fresh Green Pea Bisque, House Salad, Smoke Salmon, and Louie’s Venison Roll Ups to start, main entrees like Chicken Fried Lobster, Steak and Eggs, Buffalo Filet Oscar, and Fried Pork Chops (to name a few), and desserts as sweet as Dad such as Lemon Blueberry Cheesecake, Jack Daniels Pecan Pie, and gluten free Chocolate Decadence torte. The 3-course Father’s Day special, including a free beer for Dad for Texas Ale Project and a Y.O. beer mug to take home, is $42 per person. Kids menus will be available for children 13 and under. Our friends at Hoffbrau Steaks are known for their hearty meals and genuine Texas atmosphere and hospitality. As a family owned and operated business, they believe the Father’s Day celebrations should last more than just one day. That’s why they’re serving their Coffee-Rub Ribeye all day, all weekend. Like all their steaks, this Dad-inspired special is hand-cut, U.S.D.A. Certified, corn-fed beef, aged seasoned, and grilled just the way he likes it. The Coffee-Rub Ribeye is served with hot bread, house salad, and a choice of one Sidewinder, including mashed potatoes, steak fries, steamed broccoli, spicy black-eyed peas, steamed spinach, baked or sweet potato, and 3 cheese mac n’ cheese. 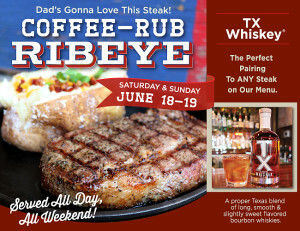 To wash it all down, pair dad’s meal with some TX Whiskey – a proper Texas blend of long, smooth, and slightly sweet flavored bourbon whiskies. If your dad is all about the barbecue, Sonny Bryan’s Smokehouse will not disappoint; and with the purchase of a meal this Father’s Day, all dads eat free! 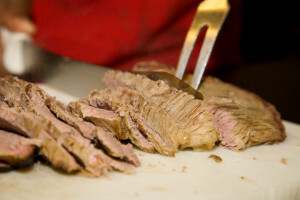 With their long list of meat offerings – brisket, sausage, jalapeno sausage, pulled pork, pulled chicken, ham, turkey, ribs, and bone-in chicken – he’ll have plenty of options to choose from. Order by the pound or in a sandwich alongside 2 veggies and a roll. Don’t forget to end on a sweet note with their Fresh Baked Apple and Peach Cobbler a la Mode and Fresh Baked Cookies. Did we mention dads eat free? Dallas Segway Tour – No matter if you’re a Dallas-native or just in town for a visit, a Segway tour is a fun and adventurous way to explore the history and beauty of our city. Dallas World Aquarium – With 5 different exhibits inhabited by marine life, reptiles, birds, and more, Dad will love a walk through the Dallas World Aquarium. Old Red Museum – Enjoy galleries displaying Dallas County’s rich past, present, and future. 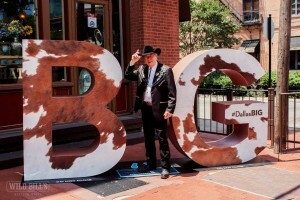 Don’t forget to stop by Wild Bill’s Western Store to take a photo with dad at the ‘Dallas BIG Things Happen Here’ B&G spot!